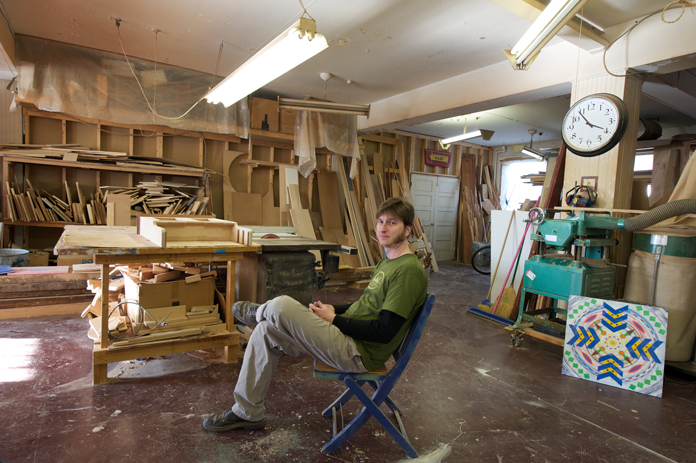 Baltimore artist Scott Pennington has been working out of a 2,000-square-foot woodworking shop and studio for about three years, holding firmly to the mantra of requiring the space to “pay for itself”. His shop, a few blocks east of Greenmount Avenue near 25th Street, contains tools, lumber and works in progress for his business, Scott Pennington Woodworking. 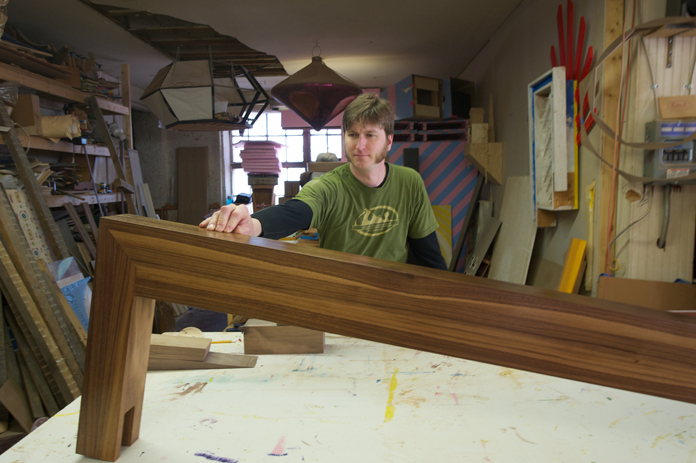 The shop and essential equipment demonstrate his intensive focus on developing fully-realized, large-scale projects, including cabinetry, tables and other custom furniture, as well as art installations. Juggling his time and resources, Scott creates pieces revealing the natural beauty of wood, and also develops art installations that typically use painted wood for contraptions and environments. He also works full-time at an interior design firm, Jenkins Baer Associates. By balancing art and work, the shop and the job, the practical sensibilities of a craftsman with the risk-taking propensities of a visionary artist, Pennington seems to find a tranquil and enthusiastic middle ground, while also making a living and gaining the resources to expand to progressively more ambitious projects. As an artisan he uses the best practices of each of his pursuits, innovative artistry, design and craftsmanship, to inform new challenges in other multimedia and installation projects, melding his carpentry skills with an artists’ eye and using wood in the service of a dynamic aesthetic honed during the past decade. To design and build elements for interiors, Scott is concerned with space utilization, proportions and composition, as well as materials. He applies his carpentry skills and attention to details to reclaimed lumber and beams, recycled for a rustic yet stylized look. Scott’s art installations use colorfully-painted wood, constructed and finished with the same care yet occupying a different, interactive aesthetic purpose. His preference for simplicity, especially with regard to the color palette, demonstrates the focal importance of color, as well as design and craftsmanship. 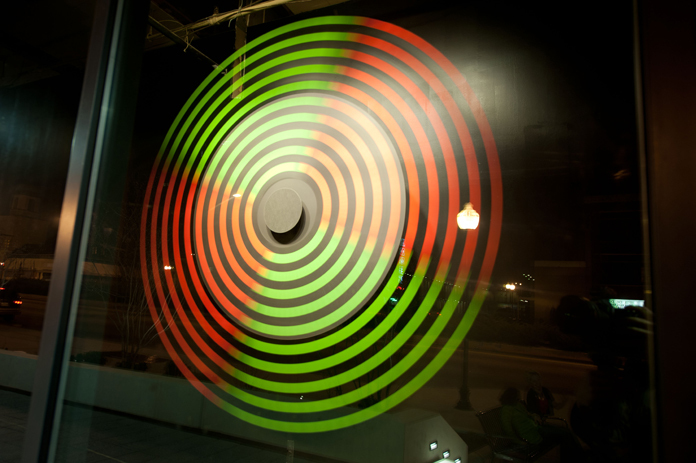 Pennington’s Peace Of Mind installation, an array of four rotating flourescent “scrubbers”, opened at MICA’s Temporary gallery in the graduate studios building next to Joe Squared a few weeks ago, and will remain there until March 16. 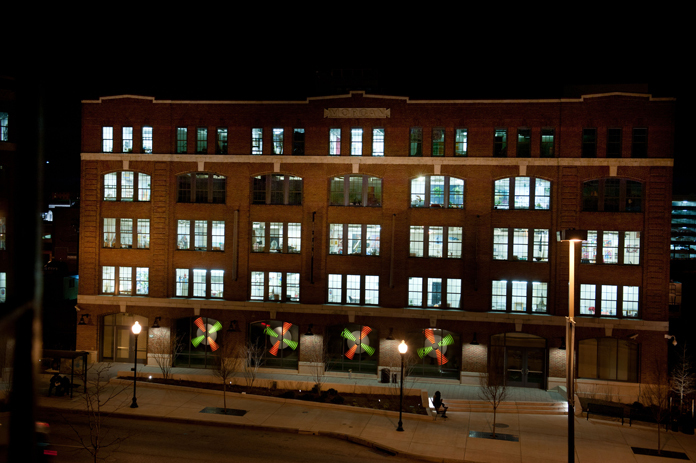 This installation and several of Pennington’s recent projects are linked together in his resume of public projects, performance happenings and installations, summarized in his portfolio on the Baker Artists Awards web site. Many installation artists at some point confront the question of whether their works are “sellable”, since the cost of a project can run into thousands of dollars. While projects of this scale provide visibility and a robust resume, stipends and grants often offset only about twenty to forty per cent of the overall cost of materials, supplies and transportation, not to speak of the many hours of work time devoted to bringing such projects in on a deadline. Pennington’s works are commentaries on time and industrial production, including the historical influence of industry and labor in Baltimore. Many of his works are both reductive and additive, as well as interactive, demonstrating a sculptural process of material handled by human “workers”, or creating an interaction of material with the surrounding external environment, a poetic commentary on factory functionality. 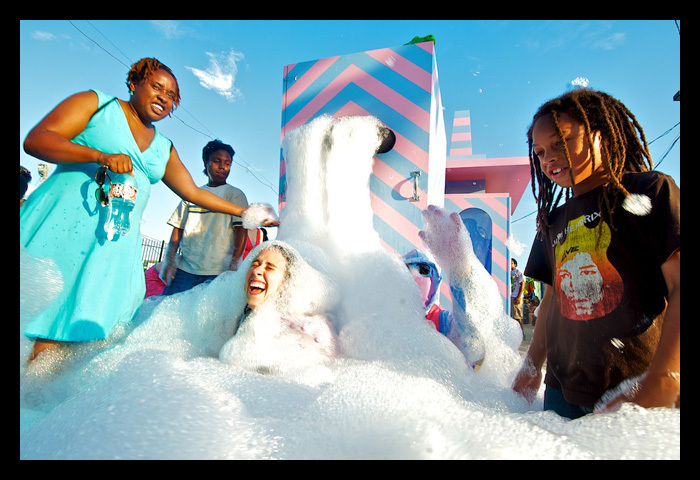 Pink And Blue Dilemma, a piece that was originally installed for the Transmodern festival, later appeared at ArtScape 2010, an outpost of Pop-art style confrontation spewing bubbly foam all over the Charles Street bridge near Lanvale Street. 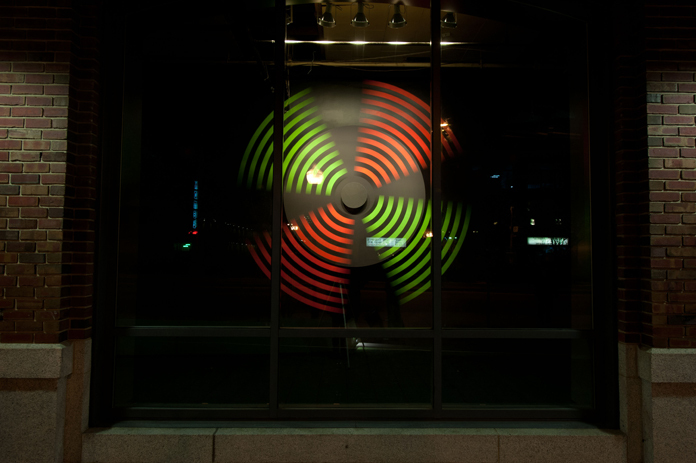 A four-hundred square foot, 1,200-pound flying saucer, titled Interstellar Species Survey (ISS), was a highlight of ArtScape 2008. 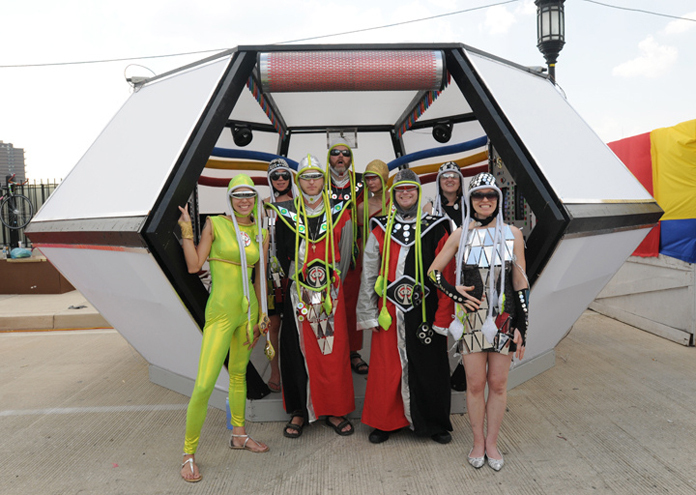 Scott built the habitable ship, and collaborated with a number of people, including Paige Shuttleworth, who created the distinctive costumes, deploying one of the more memorable “midway” exhibitions during ArtScape’s recent northward expansion. Many of Pennington’s projects involve demonstrating “work” as a function in which something is consuming participants or impeding their function, “sort of like a snake eating its tail”. His efforts to redesign, recycle and re-install components of each project tie in with an overall mission to reclaim, repurpose, recycle and re-use materials for each prototype, recognizing the available industrial waste from dumps and landfills as “our new natural resource”. 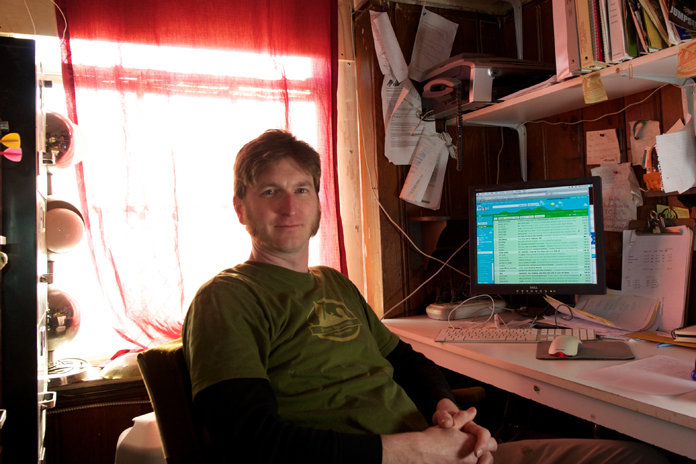 He attributes quite a bit of the content and context of his work to the positive influence of partner Melissa Webb, whose gallery installations, costume design and collaborative theater and other time-based works have complemented Pennington’s efforts, as both artists are dedicated to investigating the effectiveness of site-specific experiences that generate an audience reaction. Scott is always curious to observe and report people’s explanations and assumptions, especially kids, and to witness their enjoyment of the entertainment value of the work. 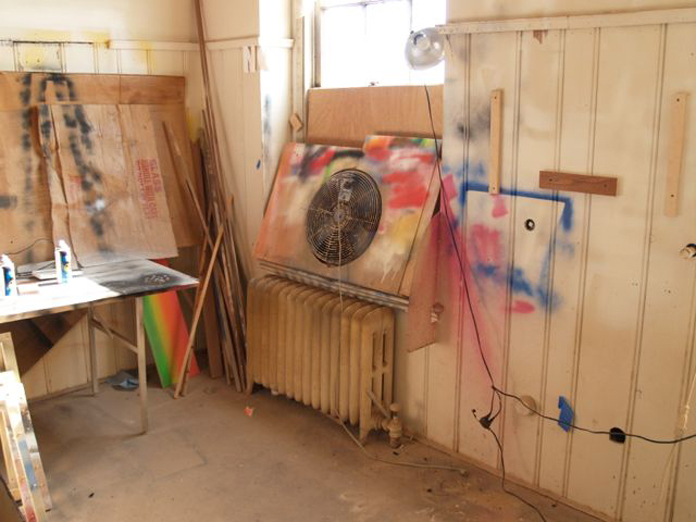 In several cases, he and his collaborators occupy the interior of a constructed environment surrounded by the audience, making the workers literally art world “insiders”. The context is strengthened by the persistent and studied juxtaposition of boundaries between interior and exterior spaces, and his latest work is no exception. The elements of Peace Of Mind were originally prototyped for the Rooms Play last year, the industrial appearance of the giant fans emphasized by construction in wood and using the motorized elements of ceiling fans for the apparatus. The current iteration of the piece is mostly built using black foam core, to enlarge the elements and enable easier transportation and function with less stress on the moving parts. The image of fans, scrubbers, turbines, metaphorically pushing some invisible substance outwards not only demonstrates a recognition of significant distinctions between interior and exterior space, but also evokes the industrial machinery now required by humans to clean and filter the air. The urban aesthetic, the title and the metaphor touch on the irony of our need for such machines, to remedy our own pollution, provoking the viewer to envision a pure solution to the problem in nature. Scott’s installation was a just-in-time delivery, he noticed that the walls in the Temporary space were painted black for a previous show, saw the opportunity, submitted a proposal and was able to install his work just a few weeks later, adopting NASA’s design and development principles of “faster, cheaper, better” for efficient budget reduction. In the Baltimore DIY movement, whether through waste separation or harvesting functioning parts from a dump site or landfill, artists such as Pennington are upgrading our cultural rationale, to seek ways to reduce pollution, make sustainable processes, and merge the artist’s life with the realities of the new economy. Scott is well aware of the easy attraction of slick surfaces, bright colors and motion, and gives consideration to functional elements informed by good design, demonstrating the entertainment value of a project with innovative energy behind it.